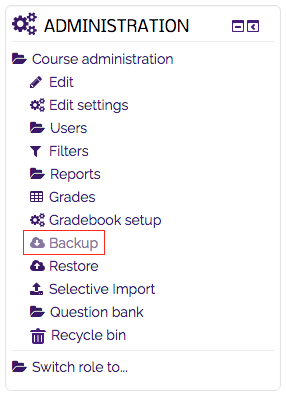 Creating a backup for a Moodle course saves all of the content of that course in an archive or ZIP file. This preserves a version of a course which will not be affected by future changes, additions, or deletions. You can later restore the back-up file into the same course, or into a different course. Teaching courses are automatically backed up once a week on Moodle. Semester backups are created several days after the final grade posting period is over for the term. These backups are available for 18 months after the course is taught providing instructors the ability to restore or import content into future courses. 1. Login to Moodle and open the course to be backed up. 2. On the left side of the new page, find the Administration Block and select Backup. 3. The backup settings are a set of selectable options to determine what all will be backed up. 5. This page shows a list of all that has been contributed to the course by both the instructors and students. 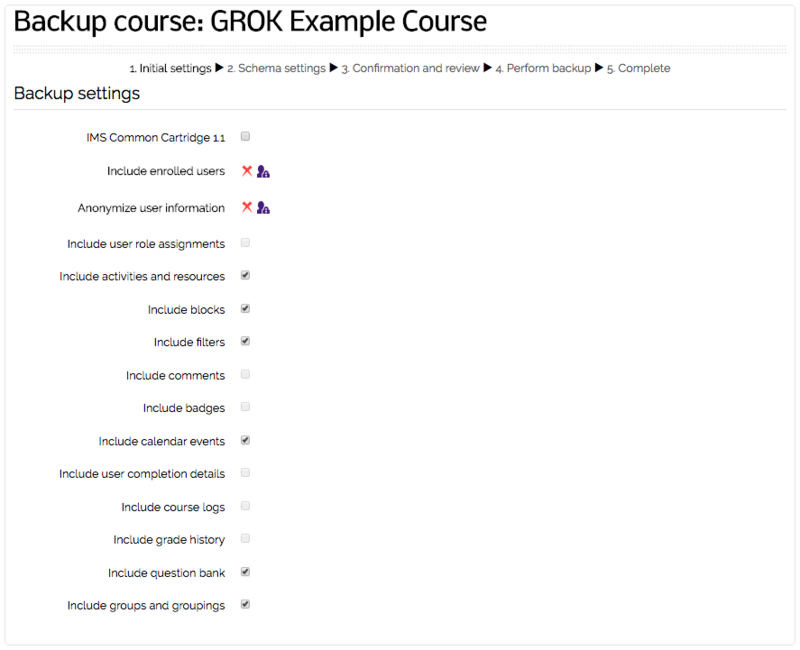 Select course materials added by the instructors on the left, and its corresponding student-generated content in the right column. Shown below is an example of a content unit within a course. 6. Once all settings are correctly selected, click the Next. 7. Verify the included items and select Perform Backup. 8. After the backup is complete, click Continue. Once you click 'continue', you can download the Moodle zipped file.